Transmigration of the self from one body to another—often known as reincarnation—is something we all experience, all the time, but may not be aware is happening. It's like this: during a single lifetime, our bodies change from infant to child to adult to elderly, but our conscious awareness stays the same. Of cours our minds change over time, and we certainly don't see things the same way as adults as we did as children, but the same sense of being—conscious existence—remains consistent throughout our lives. This conscious self, atma, always exists – before, during, and even after this life. It never dies. When one body deteriorates to the point where living in it becomes impossible, the self moves on to another. The Bhagavad-gita describes the process in detail. Our activities and desires in this life determine what kind of body we get in the next; If I live like a dog or a hog now I may very well inhabit the body of a hog or dog in my next life. If I consistently act on spiritual principles, I may be eligible to advance to a more elevated existence. Depending on the quality of our karma, work, we may find ourselves in any one of millions of species. This cycle of birth and death (samsara) goes on as long as we're addicted to temporary sense pleasure. Temporary pleasures require temporary bodies to "enjoy" them with, but the self isn't temporary. It's spiritual, and meant to experience spiritual pleasure, perpetually. Transmigration is painful, inconvenient, and foreign to our spiritual nature. It's incompatible with our desire to live in perfect health forever, in a body of our own choice. So, in His explanation of transmigration in the Bhagavad-gita, Krishna also presents the means by which to avoid repeated birth and death entirely; anyone who remembers the Supreme Person at the time of death is immediately transferred to the spiritual world and is exempt from any future births in material bodies. 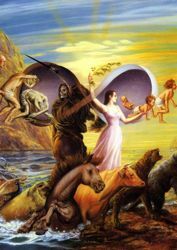 - The Vedic teaching on the cycle of birth, death, and birth again. - our next life largely depends on the degree to which our consciousness develops during this life. - “transmigration,” “reincarnation,” “life after death”—topics once hardly mentioned but now much talked about. "Since every living entity is an individual soul, each is changing his body every moment, manifesting sometimes as a child, sometimes as a youth, and sometimes as an old man. Yet the same spirit soul is there and does not undergo any change. This individual soul finally changes the body at death and transmigrates to another body…"
"To revolve in the cycle of transmigration in a series of lives numbering 8,400,000 is an imprisoned life for the condemned conditioned souls. The human form of life is a chance to get out of this imprisoned life, and as such the only occupation of the human being is to reestablish his lost relationship with God." "As long as the propensity for enjoying the fruit of work is there, one has to continue the transmigration of the soul from one body or place to another, according to one's nature of work." "Whatever state of being one remembers when he quits his body, O son of Kunti (Arjuna), that state he will attain without fail." "And whoever, at the end of his life, quits his body remembering Me alone at once attains My nature. Of this there is no doubt." How is it we've had previous births?